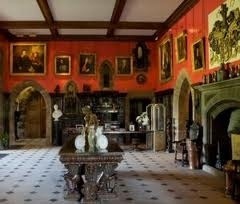 One of the most popular ideas about Britain and England in particular is that it is covered in stately homes. While this is true over 1,000 of these houses have been lost just since WW2. This was due to many factors including ‘Death Duty’ taxes but also by changing societal roles. Until WW1 most ordinary people would either work on the land, factory or for a Lord who could employ dozens or even hundreds of people in every job imaginable, they were like a modern commercial company. While it may seem awful to be a servant now, then a position in a great household was a very respectable and if the Lord was nice, good way to make a living. However after WW1 with the economy in a slump, millions of young men dead and votes and work for women just around the corner the average Lord could neither afford his old life-style or find people content to work for him. Many houses closed an were torn down destroying not just houses and ways of life but countless works of art too. Some were rescued by charitable institutions and preserved for the public while others still remain in private hands but have diversified into tourism one way or the other to pay the millions needed to keep these old estate running. 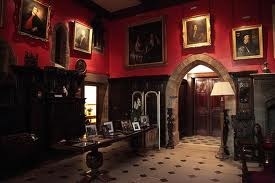 Muncaster Castle is one such estate and that is where we went yesterday. 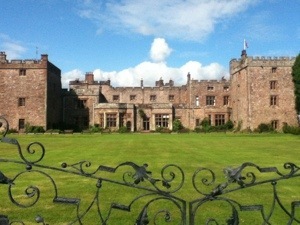 Muncaster is built on the site of an old Roman fought and unlike some homes is not a mismatch of different styles. 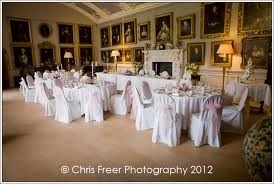 A small area of the house is fully open to the public whilst outside are thousands of acres of landscaped gardens. The beauty of visiting these houses is that they are all different and all tell stories of the history of its family or owners but also of the people liked us who would work in them. 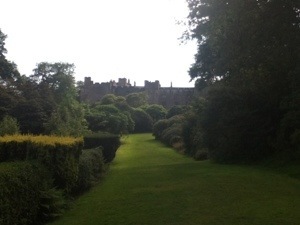 Muncaster Castle across the rear lawn. 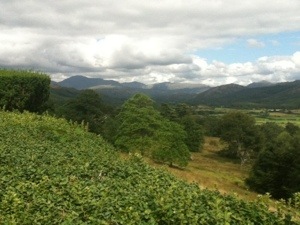 Muncaster is well worth a visit and has a great diversity of attractions. 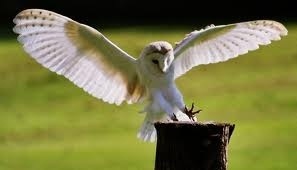 It hosts a global Owl conservation scheme with endangered owls from all around the world on view and once a day s selection of them are brought out for visitors. In historic times houses would have hermits living in their eststes and when the hermits moved up to better things the Lords would hire someone to live as a hermit in a cave or glade just to show to his visitors. 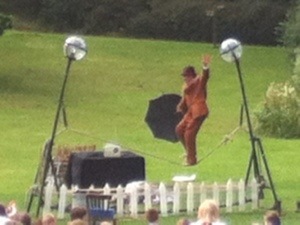 Many would have jesters or fools to entertain people and Muncaster has its very own and very good he is too. 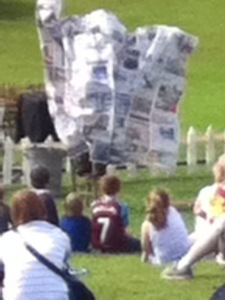 Playing the fool, Muncaster has its very own modern day jester. Some houses either give you guide books or audio guides or an actual guide who may be a member of the family. 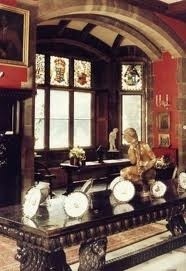 Muncaster Castle library…thousands of books and no ’50 shades of grey’. Above is the library stuffed not just with books but art too. 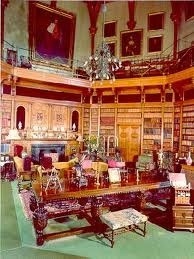 As I love books I love libraries too, this one is rather small by Country House standards with just 6,000 books. I often take my time soaking in the atmosphere and browsing the titles. A well read family with have books covering every subject in several languages and the library can be several hundred feet long. Sometimes you can make a connection with the owners when you find books you are interested in and maybe once a year you may find a book of which you have a copy too! Above and below is The Great Hall not the greatest ever but stunning in its own way and besides no-one would pay £10 to see my hallway. 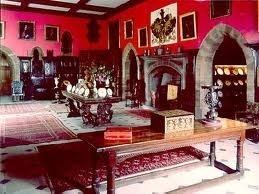 Depending on the era the house is preserved at the walls can either be decorated by armour, guns, animals, tapestries, objects d’art from around the world or like this with paintings. Sometimes the furniture is covered like this one and others it is open to view. The paintings here show numerous generations of the family. Other rooms and houses can show priceless paintings by renaissance paintings or paintings of biblical scenes or military leaders. Often houses would commission paintings of the monarch or even build spectacular suites for them hoping to win a visit and hence power. Of course the monarch could bring thousands of staff and could quickly bankrupt a family if they stayed too long or visited too frequently but one could hardly turn the king or queen down bit if they want to keep their estates or marry off their children or get into government. 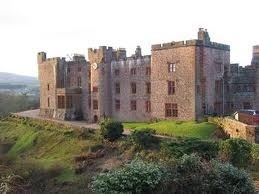 Muncaster is reputed to be a very haunted houses with ghosts of a crying baby in one bedroom and another of a murderer and is a popular location for ghost hunters or others who want to experience a very long Halloween night. Photography isn’t allowed in this house but I hope to blog of houses where I could take photos on the future. After all this walking around we had lunch in the old stable block which also hosted paintings from local artists before walking a few hundred yards to the church. It is a well conditioned 12thC church. 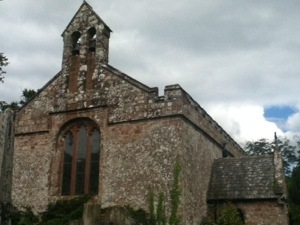 The simple and cool interior of the parish church in the grounds of Muncaster Castle. Even the most minor church can have the most ornate stained glass window. These look not just beautiful but also tell biblical stories which were important to peasants who may not understand the church service even when spoken in English, let alone French or Latin. 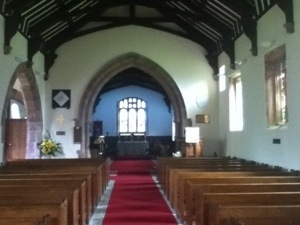 On the photo above you may just see the ropes below and infront of the window that ring the church bells. Here is the small but spparently heavenly sounding pipe organ. 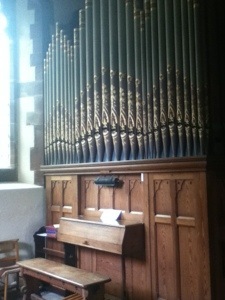 These organs were made by talented craftsmen and this one has gold leaf on the pipes. Many churches consistently require donations to preserve the organs, windows and roofs as in the U.K no religious building receives state aid which is ok if you are a cathedral in London but not a lonely chapel in a poor village. 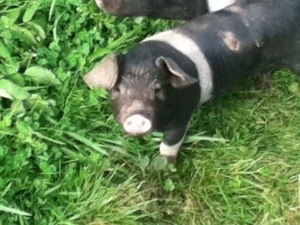 Happily the estate here keeps this one in good order. 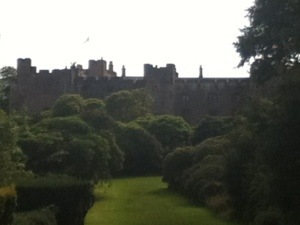 Every castle or house had its own style of garden either ornate and formal or natural and landscaped. 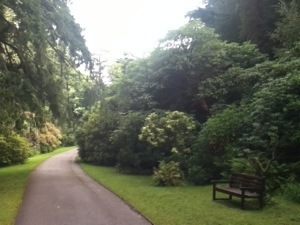 Most have numerous large gardens and Muncaster had several while walks amongst Himolayan plants and trees which it says is due to the climate and terrain being the same as nearly 12,000 feet / 3,500 metres in the Himolayas. This is due to the northerly latitude and unique weather generated by the lakes and mountains nearby. The nearby mountains here are only 3-4000 feet tall but many of them are difficult to climb with many fatalities each year but even the smallest of them look stunning. These photos show Scafell which is the tallest (Muncaster being in a valley which approached the tallest mountains from behind rather than going over the ranges just to get to them from other directions. It is rare to see these mountains not covered in cloud, most, rain or snow and my own attempt to get to the summit two years ago ended when the fog came down and a packed lunch spent watching a RAF rescue helicopter looking for some climbers stuck in one of the numerous ravines or cliff ledges. 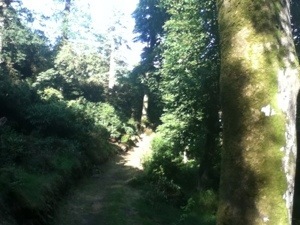 We then walked through a meadow and woods before we came to ‘the lower Sino walk’. The first Lord of the house planted hundreds of thousands of trees and bushes to protect the area from the winds and cold and recent Lords gsve brought back rare plants for breeding and studying here. Once successfully propagated these plants are bred and taken to display in more public areas around the country and the world and often will assist local people in Asia and Africa in safeguarding their precious environments where these plants can be endangered. 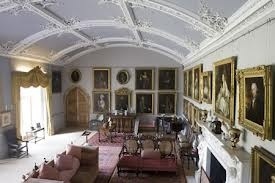 So a modern country house preserves ancient family history, national and global heritage and give us commoners a good day out. 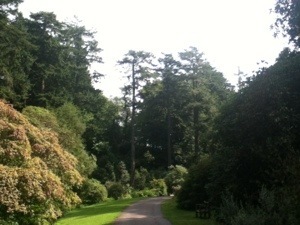 The beautiful drive through the gardens at Muncaster. I hope everyone is enjoying these daily travel blogs and can forgive the photos and odd spelling mistake. The good bits are from me, the errors are from the tiny iPod keypad! The bedroom above had Flemish tapestried on the wall which were not only decorative but also helped keep rooms warm and perhaps showed country scenes from Europe. This entry was posted in Uncategorized and tagged Culture, history, holiday, outdoors, photos, Summer, Travel. Bookmark the permalink.